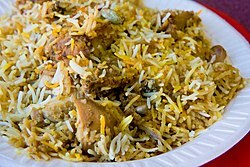 Biryani (pronounced [bɪr.jaːniː]), sometimes spelled Biriyani or Biriani, is a mixed rice dish frae the Indian Subcontinent. It is made wi spices, rice an meat or vegetables. Thurs fowk thit reckon the name comes frae the Persian wurd fur rice. Persian wis a leid uised amang Muslims in India during the ruil o the Moghuls. This page wis last eeditit on 18 September 2018, at 01:49.